What are the FTC Social Media Guidelines that Influencer Marketing Professionals Should Adhere to? With the rapid expansion of social media and influencer marketing over the last few years, the FTC has expressed concern about a lack of transparency in sponsored influencer and celebrity posts. They have issued a series of Social Media guidelines on the topic in an effort to make things clearer. The FTC guidelines are not actually all that new, and they certainly shouldn’t come as a shock to marketers at least. The first FTC Guidelines for Internet Advertising were released as far back as May 2000 - positively the stone age as far as the internet is concerned. Over the “noughties” decade, celebrity endorsement started to become more common online. This was also the decade that saw the arrival of social media; Facebook, for instance, was created in 2004. So it is no surprise that the FTC recognized this with an updating of the FTC Endorsement Guidelines in 2009. Since then the FTC has taken on a couple of big cases (Sony in 2014, and Xbox and Machinima in 2015 are particularly relevant) and as a result of these, the FTC further updated their Endorsement Guidelines in 2013 and 2015. The FTC has continued to monitor the situation, paying particular attention to both Lord & Taylor and Warner Brothers in 2016. Despite these high publicity cases, until recently there has not really been any concerted efforts by brands and influencers to abide by the FTC Social Media guidelines. Most people played a “wait and see” game before they actively tried to put the guidelines into practice. 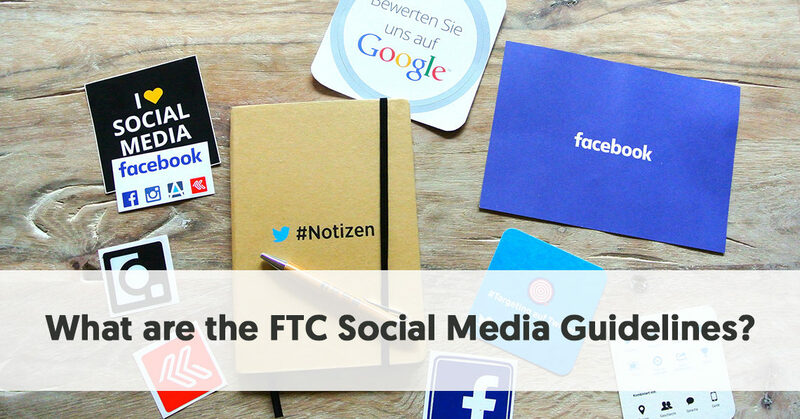 What are the FTC Social Media Guidelines? What are the Expectations of the FTC Social Media Guidelines? So What Should Influencer Marketers Do? In April 2017 the FTC decided to be more proactive and sent out letters to 90 influencers and marketers, reminding them that they should clearly and conspicuously disclose any relationships they have with brands when they endorse products on social media. These letters were written due to complaints to the FTC by various organizations who were concerned about the lack of transparency and honesty in some social media posts. This is the first time that the FTC has directly tried to educate the influencers themselves. It has had the effect of kickstarting a change in influencer behavior. This is probably because by targeting the original 90 influencers and marketers and making their disclosure expectations particularly clear, they have given the industry as a whole a wake-up call. Although the FTC haven’t publicly named who they sent the letters to, those people have clearly changed their posting behavior, and this has had a flow-on effect to other influencers and marketers. The disastrous Fyre Festival that was supposed to take place in April and May 2017, and which was heavily promoted on Instagram by such celebrities as Kendall Jenner, Bella Hadid, Emily Ratajkowski, and other models, also had an effect on people's opinions of influencer posts. Quite a few people assumed that the festival was genuinely being supported by these famous celebrities, unaware that they were being paid for their promotional activities. It probably wouldn’t have been a problem if the festival had gone as planned, however, it instead turned into a total disaster - a highly expensive disaster from the viewpoint of those who bought tickets. Many of these out-of-pocket people turned their sights on the people they had relied upon, for what they had thought were genuine endorsements. Instagram was specifically highlighted in the FTC’s letter. In particular, the letter addressed the problem that Instagram users with mobile devices usually only see the first three lines of post, and to see any extra they have to click on a “More” link. The reality is that most Instagram users are mainly interested in the pictures, and often don’t bother to click on the “More” link, so they miss anything an influencer may write about a post being sponsored if they position it later in the message. The FTC was also concerned that there was no standard hashtag for a sponsored post, and as a result, users may not understand, even if the influencer has made a disclosure. As we reported in Instagram Paid Partnership Feature - Everything You Should Know, Instagram has now made it easier to disclose paid arrangements between influencers and brands. The idea is that if there is any form of arrangement between an influencer and an advertiser then any relevant posts should be given a “Paid Partnership with…” sub-header (where the location tag is). This avoids any problems of inconsistent hashtags being lost “below the fold” in a post. The overall name of the document is, “Guides Concerning Use of Endorsements and Testimonials in Advertising”, so not all parts of the guides are relevant to social media endorsement. They define endorsement as being “any advertising message (including verbal statements, demonstrations, or depictions of the name, signature, likeness or other identifying personal characteristics of an individual or the name or seal of an organization) that consumers are likely to believe reflects the opinions, beliefs, findings, or experiences of a party other than the sponsoring advertiser, even if the views expressed by that party are identical to those of the sponsoring advertiser.” This definition, although cumbersome, clearly means that when an influencer includes any form of a promotion for products or services in their posts/videos/pictures they are technically acting as an endorser for that product. However, it is important to remember that to be considered to be an endorser here, the influencer must be given some form of benefit. You are not simply an endorser if you make a comment about a product or give a review without receiving anything in return. The FTC defines an expert as being “an individual, group, or institution possessing, as a result of experience, study, or training, knowledge of a particular subject, which knowledge is superior to what ordinary individuals generally acquire”. The reality is that many social media influencers about a particular topic would meet the FTC definition of being an expert. The guidelines make it very clear that endorsements must reflect the honest opinion of the endorser, and that they don’t make any claims that would be considered deceptive if the advertiser made them directly. This is particularly relevant in traditional advertising which quotes experts - the quote cannot be taken out of context and twist what the expert believes. An online influencer has to be careful that they don’t mislead their audiences with untruthful statements. The guidelines give an example of a campaign for skin care products using influential beauty bloggers where the advertiser asks the bloggers to try out a new body lotion and write a review on the product. Suppose that a blogger independently claims in her review that the lotion cures eczema and recommends it to her readers who suffer from the condition. In this situation, both the blogger and the advertiser (even though the advertiser never made the claim) are liable for making unsubstantiated representations about the lotion. Although advertisers won’t necessarily know what bloggers (or other social media influencers) are going to say about their products, the FTC makes it clear that advertisers have a responsibility to monitor posts and halt any continued false claims being made as soon as they notice any problems. This section of the guidelines mainly looks at businesses that include consumer endorsement in their ads. It does, however, make it clear that if a consumer is paid to give their experience of using a product, and he or she is depicted as being a typical user, then other users should also experience similar results. The section emphasizes though, that these endorsement rules only apply if money (or product) changes hands. If three people review a movie (and haven’t been paid by the movie company or theaters) and give views that are different from most people, then there's no problem. The guidelines also stress that consumers are not experts, so for example, you can’t simply provide testimonials for a product claiming to cure baldness without also showing scientific evidence. One other area covered here is that you can’t pick and choose in what you say about a product. Suppose an advertiser for weight loss shakes uses people who have used their product to promote their shakes. It would not be enough for an endorser to claim that they had lost 110 pounds in six months from losing the shakes (even if they had) unless they also talked about their change in diet and increased exercise that had also helped the weight loss. If an influencer is represented as being considered to be an expert on a subject, then they actually have to be, i.e. they have to have relevant qualifications and/or experience. While this is clearcut in traditional ads that specify that they are giving an expert opinion, it is a murkier with influencer marketing where the influencers may never claim to be an expert but are simply treated as such by their followers. This is the section which has been flouted by many, if not most, online influencers. It really is very clear. If you are paid in any way to make positive statements online (or indeed in any other way) about a product then you need to let your audience know this. In fact, it doesn't just have to be positive statements. If a firm paid you to make negative comments about their competitors (even if what you said was true) you are still required to disclose this fact. Of course, in some cases, the average person would expect money to have changed hands, and in this case, no disclosure is required. This is particularly relevant with celebrities. The guidelines give an example of a film star who endorses a particular food product. As referred to above, they are required to give their true view on the product - a known vegetarian should definitely not be giving favorable comments on a meat product, for instance. But assuming that the endorsement is honest, there would not actually be a requirement for the payment to be disclosed, because the average person would expect that the celebrity was being paid. The guidelines give another example, though, of a tennis player who talks about her life on social media. She writes a post about how she sees the ball better now because of corrective eye surgery (giving details of her surgery and where it was done). In this case, because she uses her social media to talk about her life’s events, there is no reason why the average consumer would expect that she had been paid to mention the eye surgery company. This time, the relationship with the business should be disclosed. Another FTC example is probably a fairly typical representation of influencer advertising. Suppose a college student gains a reputation for his video gaming skills and maintains a gaming blog of his exploits (they should probably update this example to focus on a YouTube channel nowadays). If a video game manufacturer gives the gaming blogger some free games, and he gives them positive reviews without disclosing the gifts, then his readers may be falsely relying on his reviews when they choose which games to buy. The fact that he was given the games for free materially affected the credibility of his reviews and he should have disclosed the gifts. In simple terms, if you receive money to write a post, status, tweet, share an image, share a video, or virtually anything else online where you are promoting a good or service, you should make it very clear to your followers. There are many ways you can do this, but it must be clear and unambiguous. You can’t hide it behind a More link, as many people used to do on Instagram, and you can’t assume that people know what a #sp hashtag means. Instagram’s “Paid Partnership with…” sub-header is a good move in the right direction. As Forbes describe in their article about April’s FTC letter-writing campaign, “The FTC says celebrity social media ads are still too sneaky”. The FTC are leveling the playing field, ensuring that consumers know when influencers truly believe what they are saying compared to when they are just saying it for the money.